With the Oscar awards this weekend, it’s interesting to note how “Dress-gazing” has become as popular as “star-gazing.” I mean, there are hour-long shows on every channel, for every award show, just to talk about which star wore what designer. Think of Elizabeth Hurley in the infamous safety-pin Versace gown, and you know just one dress can give a celebrity superstar status overnight. Which led me to think about how iconic the Disney Princess gowns are. The dresses have become as symbolic as the Princesses themselves. If you put a Disney Princess in a different dress, or make their dress a different color, she would definitely not be the same. When your child puts on a different Disney Princess dress, she pretends to be the Princess who wears that dress. Disney Princess dresses evoke visual familiarity as well as an emotional response. Cinderella’s rags, turned into a billowing soft blue gown, glides down the stairs like a cloud on the stroke of midnight while losing her legendary glass slipper. We see the sweetest and fairest Snow White, in her dark blue top, with a canary yellow skirt and red accented ribbon on the puffed short sleeves to match her red lips and bow. As you visualize Sleeping Beauty, imagine Aurora’s stately royal pink gown. The Fairies humorously changed the gown from blue to pink to blue and finally back to the popular pink, the colour of her alias “Briar Rose.” And what about bookworm as well as Geek Chic Belle, in her yellow flowing gown, waltzing with the Beast as Mrs. Potts sings that celebrated tune. Let’s not forget Ariel. Well, I don’t really have much to say about her gown, because it’s not the gown that is memorable. What’s memorable about Ariel is her shimmering teal-green tail with the clam-shell bustier, a fashion statement that which would make even Madonna envious. This is a photo of my favorite Disney Princess gown belonging to Princess Tiana, the hard-working, beautiful young girl with dreams so big. Ultimately she turned into a tiny frog, found her Prince, transformed into a Princess, all the while fulfilling her lifelong passion. This soft green, ethereal, lilypad-like dress, with a beautiful yellow flower to adorn her waist, reminds me of a luminous fairy floating on water. Picture this…Running through the Magic Kingdom, there is a little Asian girl, proudly wearing the illustrious pink and lavender Rapunzel dress that she’s worn all around Walt Disney World. She looks almost nothing like the Disney movie version of Rapunzel, yet every little girl in sight points at her, screaming “Rapunzel, Rapunzel!” Cast Members greet her at every turn, “Why, hello Princess Rapunzel!” At the meet and greet in her garden by Cinderella Castle , even Rapunzel herself, seeing this little Asian girl approaches her and exclaims excitedly, “My twin! Did you make your dress? I made mine. Isn’t it lovely?” It doesn’t matter the child’s hair or eye color, where she came from, or where she is going…in the dress, the girl becomes the Disney Princess. A dress, just one dress, can conjure up so many wonderful memories and evoke so many emotions about our favourite Disney characters. Every dress tells a Disney story. So which Princess dress is your favorite? 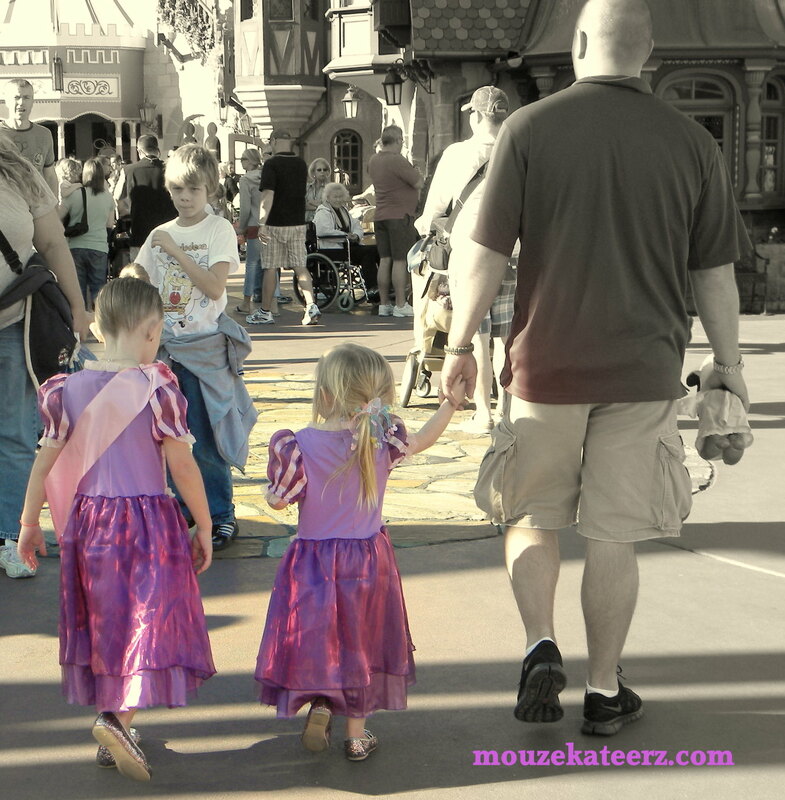 Do you Disney Moms let your girls wear their princess dresses to the Disney parks? Leave us some comments about which Disney Princess dress is your favorite. Share some pictures of you or your little Princess dressed in these symbolic Disney gowns on The Disney Moms’s Facebook page, and share your Disney Princess memories with us. Thanks for coming along for a photographical ride! Hiromi is a writer/photographer for Mouze Kateerz. Like to see more of her work? Join Mouze Kateerz on Facebook to take a virtual Disney vacation each day in photographs. You can see even more great pictures by visiting mouzekateerz.com and Mouze Kateerz on Pinterest.